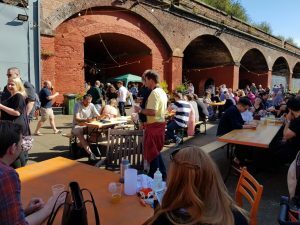 Our good friends at Mad Hatter Brewing Company held a yard party at their Brewery on 26th August and it was a great success. 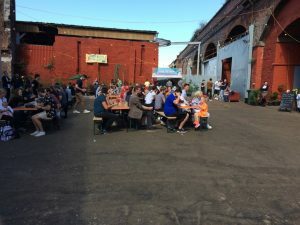 Sue @ LabelsPlus and her hubby Mark travelled over to Liverpool by train and thoroughly enjoyed the friendly atmosphere, the fine food, the superb music and it goes without saying, some fantastic beers (for Mark) and gins (for Sue). Both were warmly welcomed and made to feel right at home with typically good Northern hospitality. Have you tried any Mad Hatter Beers yet – if not why don’t you nip down to your local artisan beer supplier and check some of them out? We recommend their Tzatziki Sour, Toxteth IPA and Penny Lane beers, but Mad Hatter brew for all tastes and palates.